"Believe everything you've seen on Saturday Night Live." 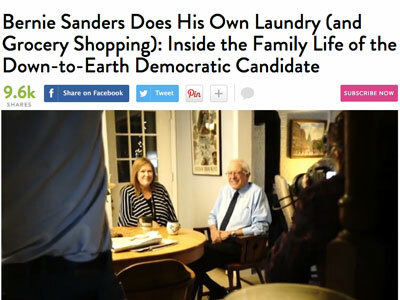 That initial impression continued throughout the interview, from Sanders’ interactions with his grandkids, to what is quickly becoming an indelible image of Sanders scooting away to finish his laundry. Aside from Sanders the family man, wood chopper, frugal spender, there is one other image of the candidate that struck Westfall. “Believe everything you’ve seen on Saturday Night Live,” she says. “The family is just as convinced he’s a dead ringer” to comedian Larry David, who played Sanders to great effect on SNL. The full interview will be in this Friday’s print issue.